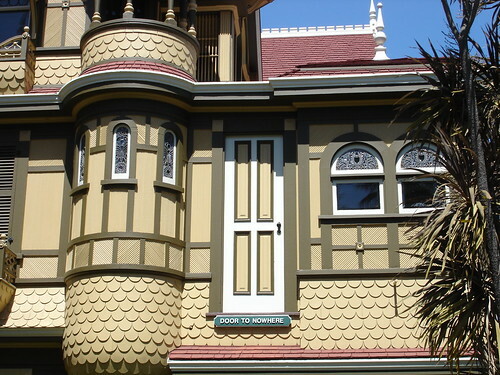 The Winchester "Mystery" House is a colossal construction built on a foundation of superstition. It's said that Sarah Winchester, heiress to the arms company, was told by a soothsayer that the ghosts of those killed by Winchester rifles would haunt her unless she moved from Connecticut to the West and built a house that could never be finished in her lifetime. Construction started in 1884 in San Jose, California, and kept going nonstop for 38 years until her death. Now the house's 160 rooms are haunted by her madness and packed with bizarre details: Staircases go straight into the ceiling, doors open onto blank walls, spider motifs abound, and candelabras, coat hooks, and steps are arranged in multiples of 13.
the WMH is a particularly expensive tourist trap, as the mansion tour alone will set you back $23.95 (a behind-the-scenes add-on is another $5). it's also spooky as hell, and i would be no match for the extra-spine-tingling evening flashlight tours given around halloween and every friday the 13th. we were there the afternoon of sunday the 13th, as it happened, and i'm surprised that our guide didn't point that out; he was all about noncoincidences like how WATCH YOUR HEAD (posted everywhere, naturally) has thirteen letters. he also had seasonal allergies to rival ours, so we heard a lot about things like the hall snork of fires and the room squerf where sarah winchester died. i was kind of grateful for his mitigating squishiness, as we were wandering around in the brick and mortar equivalent of an old lady's delusions (she based each day's construction on the ghostly directions she received in the previous night's séance). stop by, if you're into paranormal kitsch and in the san jose area! just make sure you've got hay fever, or a sweetheart who does. i toured this place in my teens...i'm sure i didn't sleep easily that night, but i have a feeling i would be far more creeped out by it today!